As I've written so many times in the past, the point of this blog is not to sell cars, per se. I write it just to point out cool, unique, often overlooked, occasionally weird, cars. If you do wind up buying one that was posted here, that's very cool. I'm glad I helped. Today's post is different, though. It is about selling a car; my cousin's 1988 E28 535i. I briefly mentioned this car in a post I wrote back in March. I've only seen it that one time. ~~ My family is scattered along the east coast. We don't see each other much. I grew up on Long Island. Shortly after I turned 18, my immediate family moved to Virginia, just outside of Washington, DC. I stayed behind. My cousins grew up in Virginia, but slowly started migrating north to New York. In order to escape the onslaught of relatives, I moved to Massachusetts. ;) ~~ I was amazed (and somewhat jealous) of how nice the car was. Gretchen (my cousin) e-mailed me last week and said that she and her husband have decided to sell their BMW. 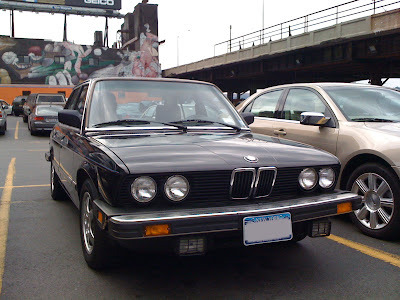 Manhattan is a great place, but it is no place for a classic BMW. Based on what I saw back in March, the car is in very nice shape. It has approximately 192,000 miles on it. The odometer quit at 186,000. It has a couple of tiny rust spots, but nothing serious at all. The seats show wear (patina) but are not ripped. There is one small rip in the headliner, just above the driver's head. The front bumper could use a bit of work. (According to Gretchen, "My husband's uncle, the original owner of the car, apparently clipped his garage several times in the car's life.") It recently had a full service (tune-up, fluids, etc.) and comes with all service records (including those prior to Gretchen's ownership). 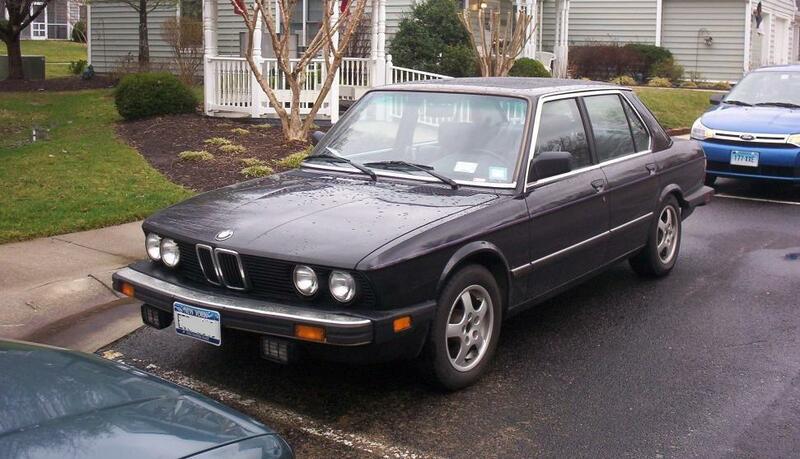 This could be a very cool, everyday driver, E28 for someone. Right now all I have is the picture I took and the one Gretchen sent me. If I get some more pictures from Gretchen, I'll update this post. If you're interested, send me an e-mail (contactATjustacargeekDOTcom) and I'll put you in touch with Gretchen. 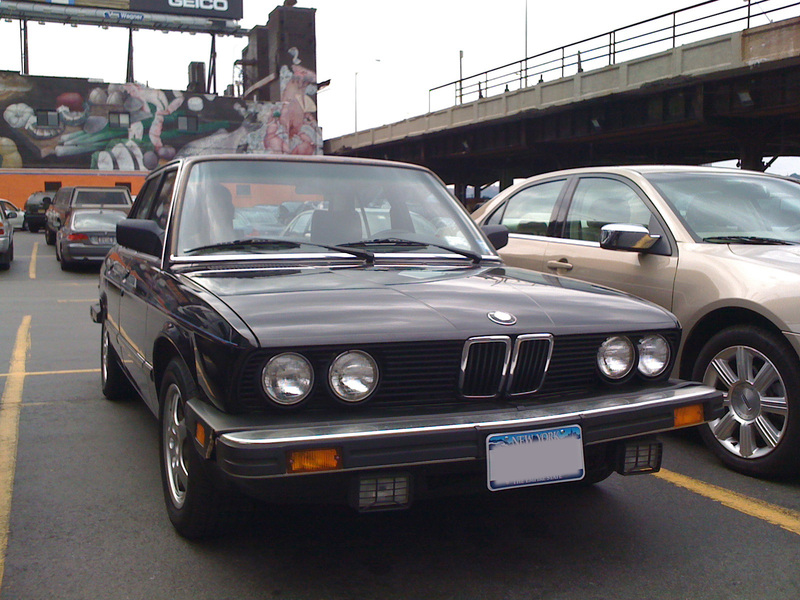 Is there any car in history that has been burdened by bad, out of place, wheels as much as the e28 5 series? In fairness to your cousin though, I get it.....one time I had to replace a set of TRX tires on a 6 series I owned....Holy crap. I probably would have put chrome spinners on her before buying those tires again. It's too bad, too. The TRX wheels looked great.